Hyderabad: Cracks seem to have appeared in the Opposition even before the proposed grand alliance could take shape in Telangana State. Over the past few weeks the Congress has been mulling forming an alliance with anti-TRS and anti-BJP parties to defeat the TRS in the upcoming state elections. On Sunday, the Telugu Desam too sprang into action to form a 'grand alliance'. The Telangana TD president, L Ramana, held talks with the Communist Party of India on seat adjustments and invited Telangana Jana Samithi chief Prof. Kodandaram for talks. He is expected to meet Telangana Pradesh Congress Committee chief N. Uttam Kumar Reddy on Monday to discuss the grand alliance. After the meeting, Mr Ramana and CPI leader Chada Venkat Reddy announced the formation of an alliance for the Assembly polls. The Congress is willing to offer 30 seats to the TD, CPI, CPM and the TJS out of the 119 in the state. While the Congress leaders in south Telangana - where a considerable number of AP-origin people reside - are in favour of a tie-up with the TD, those in North Telangana districts are against it, fearing that the TRS would fuel 'regional sentiments' by projecting the TD as an "Andhra Party". 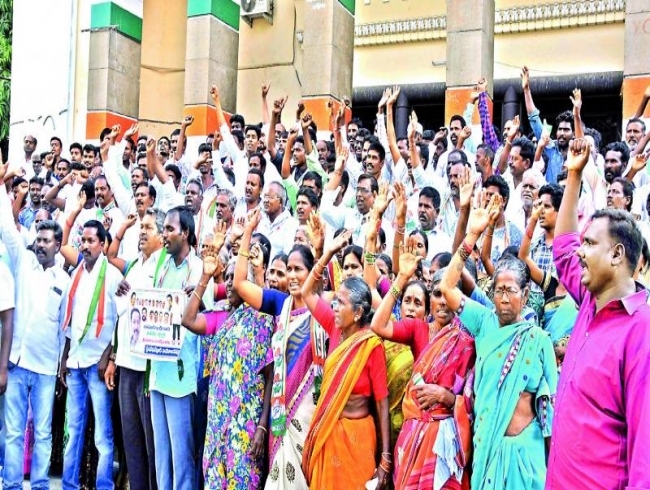 On Sunday, scores of Congress leaders and activists from Warangal and Khammam districts held a flash protest in front of Gandhi Bhavan. They demanded that the TPCC not allot Wyra and Station Ghanpur seats to the alliance partners. They threatened to contest as rebels if the party ignored their demand. While the TD is demanding all the seats which it had won in 2014, Congress ticket aspirants in these seats are opposing this. The preliminary talks between Congress and other Opposition parties have been going on for the past few days on seat adjustments for Assembly polls. Congress sources said the party was keen to offer 15 seats to the TD, six to the TJS and four each to the CPI and the CPM. While this remains the case, the CPM is learnt to be opposed to joining an alliance that contains the Congress. It is trying to have a tie-up with the Jana Sena of film actor Pawan Kalyan. It has held preliminary talks with Jana Sena leaders in this regard. Congress leaders in North Telangana argue that the region has 56 seats and the TD has no presence there. They express concerns that if the TD is given seats in these districts, it would prove disastrous. Their counterparts in the south Telangana districts on the other hand argue that the Congress-TD tie-up was necessary to beat the TRS in Hyderabad, Ranga Reddy, Medak and Nalgonda districts, where a considerable chunk of AP-origin voters reside.